Henley's wallabies: Where do they come from? 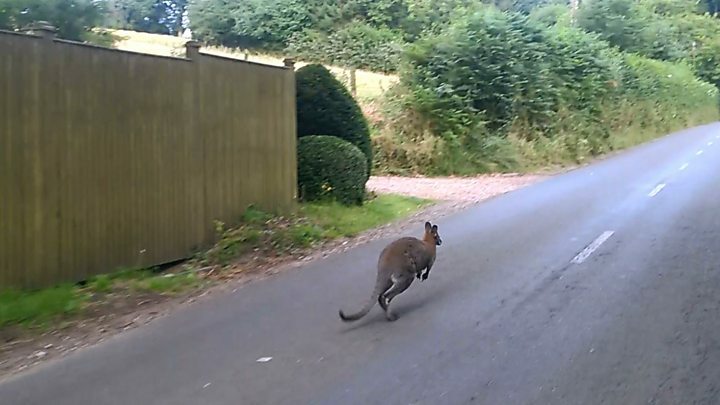 A wallaby recently made headlines after it was photographed by a stunned binman in Oxfordshire. But from readers' responses it seems for those living near Henley-on-Thames the sight of the marsupials hopping over fences and across roads has become almost mundane. For years they have been sighted across south Oxfordshire, and in 2002 there were even reports of "delinquent" wallabies taking over the town. So how easy is it to spot one and why are they there? Visitors to the BBC Oxford Facebook page offered a number of suggestions for where to start the search. The leafy village of Nettlebed is about four-and-a-half miles north-west of Henley-on-Thames - a town famed for its annual rowing regatta but not necessarily for its wandering wallabies - and has been described as a "hot spot" for the creatures. Image caption Nettlebed has been described as a "wallaby hot spot"
Andrew Cahill says he saw one while walking his dog in the village and did "the most massive double-take". "I saw it out the corner of my eye and thought it was a fox," he said. "It's probably a cliché, but you expect to see wallabies in Australia, not Oxfordshire." According to John Gillespie, they have been seen since the early to mid 1970s around the Henley/Nettlebed area "with a few being run over up and down the Bix dual carriage way". And even if you think you haven't see one, maybe you have? John Slater has a tip should you find yourself in the area: "Look carefully and you may see some more amongst the deer". However, a trip to the picturesque village of Shepherd's Green where the animal was snapped last week, failed to unearth a wallaby - although resident Sarah Stevens suggested the source of the sightings was the nearby Fawley Hill estate owned by Sir William McAlpine. Middle Assendon resident Louise Chater also shared her wallaby sightings. "They look like big rabbits or hares," she said. "We've seen them jumping between fences up near Fawley village." Image caption Fawley Hill has enclosures to prevent animals "pottering into Henley"
The Fawley Hill website appears to support the theory it's behind the macropod mystery, admitting responsibility for past sightings - but then again not recent ones. "We don't approve of 'cages' but some of our animals do need their own enclosures to prevent them pottering into Henley when they feel like it, "it says, but then: "This is not a joke: the wallabies did: but now although they COULD, they don't bother." And indeed when the BBC contacted Fawley Hill after the recent sighting it was told all their wallabies were accounted for. There are other theories which point to Beale Park, a wildlife attraction based about 10 miles (16km) away in Berkshire, which also keeps wallabies, and the BBC has been told a man in the area keeps wallabies privately and they sometimes run off, resulting in occasional sightings. Meanwhile, it looks like the population is growing. In 2004 Tiggywinkles Wildlife Hospital said accounts of wallabies living wild in Buckinghamshire and Oxfordshire had increased. But how they got there and how many there are, for the moment at least, remains a mystery.